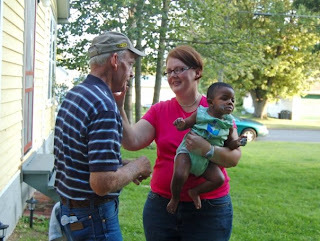 On Friday August 22, 2008, I first heard of the possibility of adopting little Mason. I waited breathlessly all weekend hoping that his birth parents would indeed bring him to the adoption agency on Monday August 25th. When I was contacted on Friday, the agency wasn't even sure if he was a boy or a girl. They forgot to ask! On Monday, when he finally arrived, I remember calling and hearing him crying in the background. He was hungry! His parents brought him in with no bottles and no diapers, and everyone was scurrying around to buy supplies to care for him. Finally, Melissa showed up and took him home to care for him for two days until I could arrive. Melissa sent me the first picture I have of him from her iphone.